Terrorizer Magazine has pissed off a lot of people lately. It’s one of the publications that has been covering U.K. and international metal music for years (your editor used to be a regular contributor), but last year the monthly publication started running into “production difficulties,” first addressed in a Facebook post in September 2017. In November 2017 its Facebook page went dark, followed by its Twitter page in December, with no news about any new issues coming out. The website isn’t doing any better, with web ads still up for festivals that have come and gone. In March of this year, however, the mag finally posted on Facebook that it’s getting back on its feet and will honor its subscriptions and issue refunds. While the jury might still be out on that, judging by the comments on the magazine’s posts, Terrorizer followed up with issue #287, which the mag released in May 2018—the first new issue since November 2017. 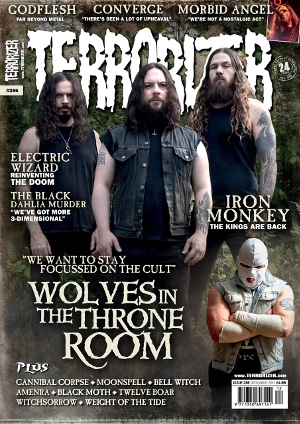 In June 2018, Terrorizer released issue #286 from last year, which never went to print, as a free download at PocketMags (which requires a free subscription). And after that, there’s been no news. Here’s hoping that Terrorizer satisfies all of its customers, first and foremost, and starts putting out regular issues again. This entry was posted in News and tagged magazine, Terrorizer Magazine, UK by Editor. Bookmark the permalink.